Meditation Online for Free. Just Click the Play Button. Meditation. Can you meditate on autopilot? At the click of a button? This sounds like an ideal solution for people who want to experience the benefits of meditation but have little practice meditating, do not have the time to learn it or are always busy. Meditation has been practiced in Eastern cultures for thousands of years as a door to awareness, wisdom and enlightenment. In fact, "Medha" means wisdom in Sanskrit. In Western cultures, meditation is relatively new but its increasing appeal comes from the fact that that it has proven to be effective to relieve stress, high blood pressure, depression, anxiety and insomnia, while it has also shown to improve memory and brain function in people who practice meditation regularly. Meditation is the the cultivation of a calm and positive state of mind. It is not about "doing" -hence the usual difficulty to understand it- but about "being" in a state of thoughtful awareness, focusing only on the present moment and not on the past or the future. Why focusing only on the present? Because, as Lao Tzu wisely observed, "if you are depressed you are living in the past. If you are anxious you are living in the future. If you are at peace you are living in the present." In fact, besides its documented benefits in the health domain, meditation "helps you develop an unshakable sense of peace -no matter what the world out there is up to", as Sarah McLean points out. And "when you meditate, you activate cosmic energies", as James Van Praagh notices. Furthermore, the full beauty of meditation comes to light when you consider that "prayer is when you talk to God; meditation is when you listen to God" as Diana Robinson observes. Obviously, achieving such a state of mind and thoughtful awareness seems not an easy feat and makes you think that it can only be mastered by constant practice over a long period of time. And it may be so, unless you consider the possibility of using brain frequencies as a valuable tool to experience the benefits of meditation even if you are not an experienced meditator. Indeed, brain waves play an important role in meditation. The majority of adults operate in Beta (13-30 Hz), which is a frequency associated with alertness and left brain activity (logic and critical reasoning). It allows working effectively throughout the day, but it can also lead into stress. The Alpha brain frequency (8-12 Hz) relates to a state of relaxation and a wakeful, effortless awareness where concentration, learning, imagination and visualization are heightened. The Theta frequency (4-8 Hz) is associated with deep meditation, the REM dream state, insight, spiritual connection and access to the subconscious mind. The Delta (0.5-4 Hz) brain frequency corresponds to the deep sleep that is needed for regeneration and can also be attained during profound transcendental meditation. 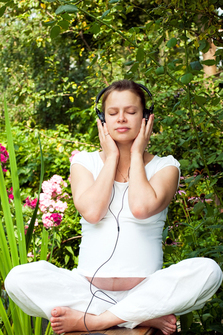 Sound healing can help you attain the deeper brain waves through the use of auditory binaural beats. This technique, discovered in 1839 by Prussian physicist Heinrich Wilhelm Dove, entails using two coherent sound frequencies which are assigned one to each ear with stereo headphones. The brain integrates the two signals, producing a sensation of a third sound called the binaural beat. For instance, if a sound frequency of 100 Hz is played in the left ear and a frequency of 107 is played in the right ear, a binaural beat of 7 Hz is created by the brain and an increase in brain waves of 7 Hz naturally occurs. However, some people find binaural beats annoying and dislike the fact of having to listen to different frequencies on the right and left ear in order to achieve an Alpha or Theta meditative state. So what to do? Is that the only solution offered by sound healing? Not necessarily. There is an alternative solution for those who do not like binaural beats. This solution is to mix the two different frequencies in the recording itself, so your brain does not have to put an additional effort. Your brain receives the frequencies already mixed. You can just close your eyes, listen and relax in the present moment while the sound does its job. With this in mind, I have prepared for you two different recordings. One for the Alpha state and one for the Theta state. In both cases the frequencies are already mixed in the recording itself. And the frequencies used are not just random frequencies. They are Pythagorean frequencies, which add their important part to the healing effect of the recording prepared for your meditation. In addition, forest birds and water sounds have been added to both recordings, in order to make your meditation experience even more pleasurable. Feel like meditating in the jungle. All you have to do is sit still, relax, and listen to the recording. Close your eyes and place them behind your upper eyelids. At some point, (usually within the first minutes) your brain will synchronize to the Alpha or Theta sound frequency (this is called "entrainment") and you can enjoy being in this state for the remaining part of the meditation session. Each of this recording lasts 20 minutes, which is the usual amount of time for a single meditation session. Do not drive nor operate machinery while you listen to these recordings. Also, after listening to them, take some time to return to your state of full attention before engaging in your normal activities. For optimal results, listen with headphones or earphones, because normal computer speakers or mobile device speakers do not play correctly the Alpha or Theta frequencies. You can listen online to both recordings here. Meditate online every time you want. Yes, you can also purchase these meditation recordings to play them on your computer or your mobile device.